Bots represent 30-70% of website traffic — it’s critical to understand who is behind them and what they are doing. To protect yourself from poor performance, customer churn, and even fraud, you need an effective bot management strategy that brings bots under control. 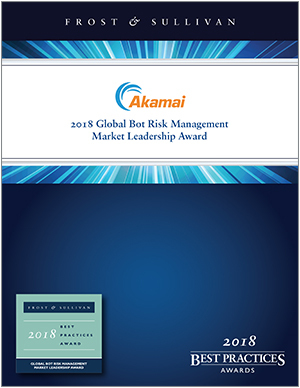 Frost & Sullivan has recognized Akamai as a market leader in bot risk management — both in terms of our technology and research. Download your copy of the award announcement today to learn about the risks bots pose and how to protect your business.